For a seventh year running, we skip ranking the current year’s films and instead hark back 90 years. We started out with a list that was essentially an appendix to an entry, but soon we were dedicating whole entries just to the list. Our entries for past years are here: 1917, 1918, 1919, 1920, 1921, 1922, and 1923. 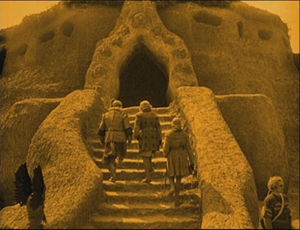 These lists are our way of calling attention to important silent films that some readers may have overlooked. In one case here we point out a largely forgotten film that deserves to be better known, in the hope that an archive will take the hint. With the proliferation of silent-film festivals, of DVD and Blu-ray releases with restored prints and supplemental material, and of TCM’s eclectic screenings of foreign and silent titles, there seems to be considerably more interest in these early classics. Herewith our choices for 1924. For the last few years I’ve struggled to fill out the full list of ten films with truly deserving items. But as I’ve been predicting, the 1924 choices fell easily into place. As usual, some of these are obvious picks, already famous to most readers. Others are less obvious, and a few are unknown except to specialists. Some, though very important historically and artistically, are not currently available on DVD, which is a real shame. 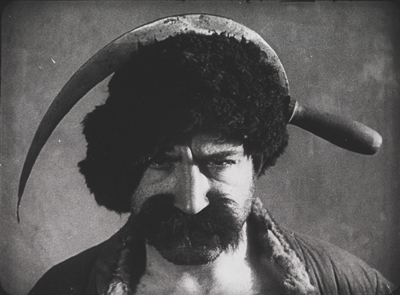 Films in the Soviet Montage style make up one of the most important cinema movements of all times. 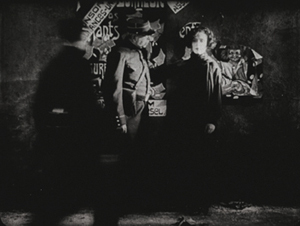 The key filmmakers of the movement, Eisenstein, Pukovkin, Dovzhenko, Kuleshov, Kozintzev and Trauberg, and others began their work later than the German Expressionist and French Impressionist directors. But at last one joins our list, with Lev Kuleshov’s The Extraordinary Adventures of Mr. West in the Land of the Bolsheviks. 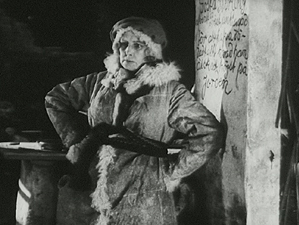 Although Kuleshov’s work has become more widely available, his most familiar work is still By the Law (1926), a grim tale of two members of a gold-prospecting team agonizing over how to bring to justice a colleague who has committed a terrible crime. Mr. West couldn’t be more different. This hilarious and grotesque comedy satirizes American perceptions of the new Soviet Union, as Mr. West, president of the YMCA, comes to for a visit, his faithful cowboy friend Jeddie in tow. They’re terrified of the barbaric land they expect to encounter, and a gang of thieves dupe Mr. West by dressing up in outfits that caricature West’s images of Bolsheviks (above). In making the film, Kuleshov and his team drew upon the experiments they had been doing in his classes he ran of the early 1920s. Film stock was scarce and all he and his students could do was practice staging scenes and make short editing experiments. They explored the possibilities of “biomechanical acting,” a style based more on gymnastic control and energy than on psychological subtleties of facial expression. Once the group did get the resources to make a feature, their delight is evident in the lively editing and the exuberant performances. Alexandra Khokhlova, a gangly woman who was married to Kuleshov and starred in most of his films, plays a vamp who tries to lure Mr. West into her toils. Pudovkin, who studied with Kuleshov before going into directing himself, is the well-dressed gang leader who pretends to guide Mr. West away from danger. 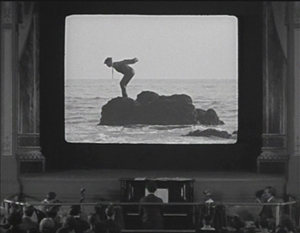 Boris Barnet, also to become a major director, performs feats of derring-do as Jeddie tries to save Mr. West. Last year I was hard put to pick a film to represent the German Expressionist movement in the top ten. I chose Erdgeist but mentioned Schatten and Raskolnikow as runners-up. By 1924 there were fewer Expressionist films released, though the movement would linger on until 1927, mainly carried on by the two greatest directors who had worked in the Expressionist movement: F. W. Murnau and Fritz Lang. Each of these contributed a classic film in 1924: Murnau’s The Last Laugh and Lang’s two-part epic: Die Nibelungen: Siegfried and Kriemhild’s Revenge). The Last Laugh isn’t really Expressionist. The sets are mildly in the style, but what really fascinated Murnau at this point was the freedom of camera movement introduced by French Impressionism. He set out to make a character study. Emil Jannings plays a doorman in a large hotel (none of the characters’ names are given). His regal bearing and fancy uniform bring him respect among his fellow employees and from relatives and neighbors in the lower-middle-class neighborhood where he lives. He has aged to the point where he carry large luggage and is abruptly demoted to work as a rest-room attendant. 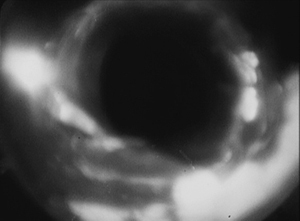 Murnau introduced what came to be known in Germany as the entfesselte Kamera, the “unfastened camera,” beginning in the opening shot where an elevator with a grill descends, carrying the camera and dramatically revealing the lobby. 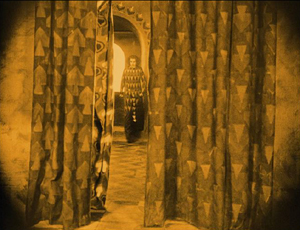 Murnau may have been directly influenced by one of last year’s top-10, Cœur fidèle, where Epstein put his camera on a spinning-swings carnival ride. 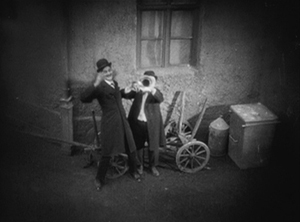 Murnau saw other uses for the device. Like the Impressionists, he conveyed drunkenness through moving camera, though in this case he put the actor and camera on a turntable, so that the room spins past behind Jannings, conveying the dizzy happiness of the doorman at a party (above). Using more imagination, Murnau follows sound with his camera. As the party ends, musicians exit to the apartment-block courtyard, and one plays a final tune under the window. Starting with a close-up, the camera “cranes” diagonally up and backward until the men are in long shot. A cut takes us to the doorman inside, happily listening. Actually the camera was not on a crane. Murnau and cinematographer Karl Freund affixed a track over the courtyard with a small metal elevator underneath, so that the camera could move both back and forth and up and down. The camera was not literally unfastened in these cases, but it looked like it was. The Last Laugh got distribution in the USA, but it was not a success. Hollywood practitioners studied it, though, and started hanging cameras from tracks themselves and trying other tricks. The track backward above a long, laden banqueting table soon became a cliché of Hollywood cinema. The Last Laugh is available from Kino in the USA and Eureka! in the UK. 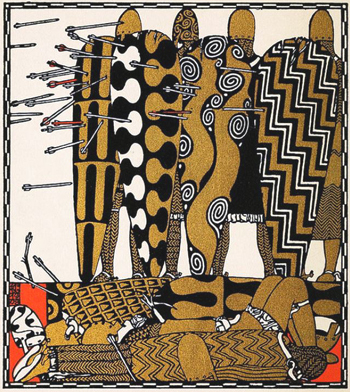 One of my favorite films of the 1920s is Lang’s two-parter, Die Nibelungen: Siegfried and Die Nibelungen: Kriemhilds Rache (Kriemhild’s Revenge). An adaptation of the ancient German myth, it mostly proceeds at a stately pace until the final battle scene. 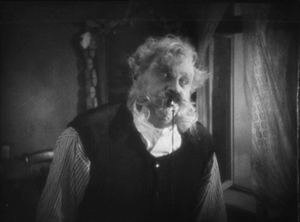 Some may find it slow, especially when compared with the lively, suspenseful Dr. Mabuse der Spieler (1922) and Spione (1928). Yet its leisurely presentation is appropriate to the subject matter. Equally important, lingering over images allows us to notice the details of the extraordinary settings and costumes, with their busy decorated surfaces and their startling arrangements within the shot. Take the image at the top of this entry. Brunhilde, having been forced to marry King Gunther against her will, envies her sister-in-law Kriemhild, who has married Siegfried, the man Brunhilde loves. In this shot, Brunhilde mounts the steps of Worms Cathedral to confront Kriemhild and assert her right to enter the cathedral first. 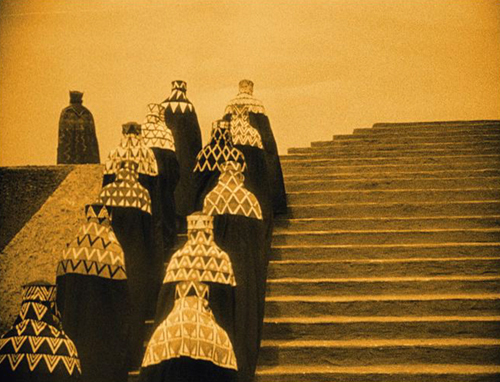 We see her from behind and then at the upper left as her ladies follow her, wrapped in their patterned hoods and black cloaks, creating an almost abstract composition. Lang build the enormous stairway outside the cathedral in two stages and then used the set imaginatively to stage several ceremonies and dramatic conflicts. What makes this film Expressionist, I would argue, is the way the actors and settings interact, as in this moment when Brunhilde pauses by her window and then comes forward through the slightly parted curtain, exiting left. 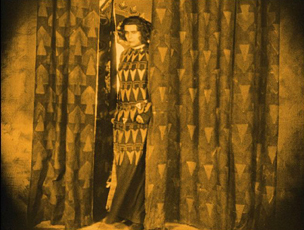 She pauses in the opening, her dress seemingly becoming part of the curtains for a moment. The elements of the German tales are all here: love, betrayal, suicide, revenge, presented in images worth savoring. Yet the resemblance is far from exact. Clearly Lang used elements from these illustrations and took them off in his own direction. The film has recently been restored and looks great on Blu-ray. Kino in the US and Eureka! in England have brought it out. Both have DVD editions as well. 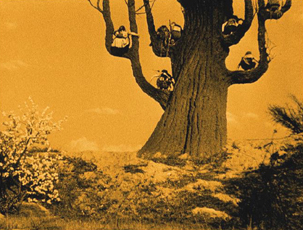 During the first half of the 1920s, the Swedish cinema was a victim of its own success. Victor Sjöstrom (who has figured in these lists in 1918 and 1921, as well as in our “Lucky ’13” entry), had headed to MGM, becoming Victor Seastrom. 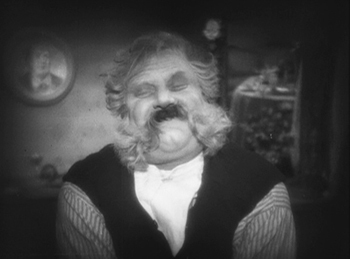 In 1924 he released his first two films in 1924: Name the Man and He Who Gets Slapped. The latter was the newly formed MGM’s first in-house production to be released. It was a huge success, no doubt in large part due to the growing stardom of Lon Chaney, and it put the studio on the map and allowed Seastrom to stay in Hollywood, notably for The Scarlet Letter (1926) and The Wind (1928). Mauritz Stiller (also a previous top-10 choice) was about to head for Hollywood as well, but his final Swedish film is one of his finest. 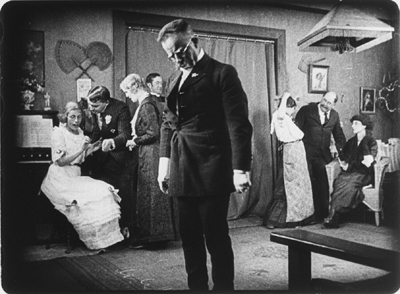 Gösta Berlings Saga, a epic adaptation of Selma Lagerlöf’s novel, was made in two parts lasting over three hours. Many people will know it as the debut film of Greta Garbo. Fans should be forewarned that she is an important character and appears in the early and late scenes but disappears for a long stretch in the middle. The film begins with Berling, a drunken pastor in a small town, being relieved of his duties. He ends up being taken in the “Chevaliers” at Ekeby the country estate of Margaretha Samzelius, a tough middle-aged woman who runs a group of foundries she has inherited from a lover. The Chevaliers are a group of hangers-0n, men who can drink and laze about most of the time but who must be charming and entertaining at Samzelius’ many dinner parties. Berling has a number of chances to redeem himself but ends up harming the people around him and sinking lower into despair. He is finally redeemed by the love of the Garbo character, Elizabeth, the new bride of a wealthy neighbor, to whom, it turns out through a technicality–and happy coincidence–she is not actually married. As usual, the film contains lovely scenes in the Swedish landscapes. There are some impressive night sleigh rides, including a famous scene in which Berling and Elizabeth are chased across a frozen lake by wolves. There is also one of the most impressive fire scenes I can recall from the silent era, as Samzelius’ efforts to smoke the Chevaliers out of the guest house where they live and inadvertently sets fire to the big main house as well. Unfortunately the film was cut down into a single feature for its release outside Scandinavia. The Story of Gosta Berling was the main version that circulated for many years. 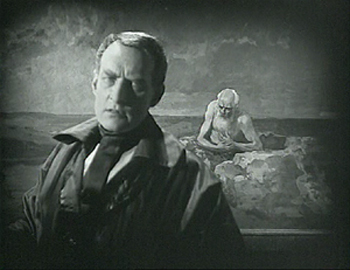 The Swedish Film Institute restored it in stages as more footage was found, but the current print, at 183 minutes, is still missing some footage. Beware picking up an older video release with the truncated film. The restored version was released on DVD in the USA by Kino. The original Svensk Filmindustri release (with English, French, Portuguese, German, and Spanish subtitles), is available here. The same DVD comes in a box set of six Swedish silent classics, which is widely available from the usual online sources. Carl Dreyer has popped up on this blog several times, usually in passing. Not surprising, since David wrote a book about him way back 1981. Here he makes his second appearance on our ten-best lists (the first having been for his first feature, The President, in 1919) with Michael. The film centers around a wealthy, aging artist, Claude Zoret. 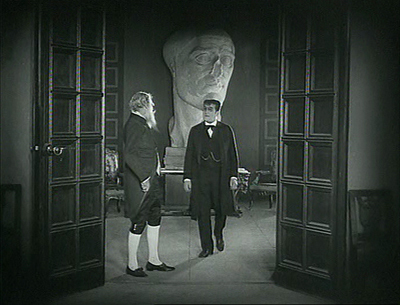 The main room of his house is decorated with several eye-catching pieces of sculpture, notably a mysterious battered head that looms in the background of many shots. Is it one of Zoret’s own works? Is it part of a collection of ancient statues? Much of the action takes place here, which has led some historians to place Michael in the tradition of the Kammerspiel. David calls it a borderline case. There are certainly scenes that leave Zoret’s studio, most notably one in a large theater set. 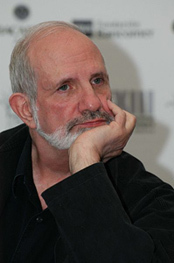 The film has been hailed as an early treatment of homosexuality. Although there is nothing overtly expressed, it is hard not to read such a subtext into the action. Zoret, wonderfully played by Danish director Benjamin Christensen, has many guests and admirers visit him, creating a little all-male coterie. He has taken in a young protegé, a very beautiful and very young Walter Slezak. Zoret refers figuratively to Michael as his son, but there seems to be another tie between the two. Moreover, there may be a hint that Charles Switt, a journalist apparently writing a biography of Zoret (at the center of the frame above), feels some jealousy toward the young man. Trouble begins when a princess comes to commission a portrait from Zoret. Although he usually doesn’t do commissions, he is intrigued by her face and agrees. During her visits to the studio to pose, she meet Michael, who is immediately smitten. The affair continues as Michael becomes increasingly inconsiderate to Zoret,borrowing money to continue the affair and missing an important showing of his work. In contrast, Zoret shows unwavering generosity to Michael, despite being devastated by his desertion. Ultimately Zoret paints his last work, showing an elderly, lonely man against a barren seascape. It is hailed as a masterpiece at a party which Michael does not attend. The character study proceeds at Dreyer’s usual formal pace, and yet it is never dull. As much as any of his silent films, it looks forward in tone to his later sound ones. A very nice print of Michael is available in the UK from Eureka! (not deliverable to the USA); Kino released what I assume is the same print in the USA. Every now and then I want to put a film on the list which is impossible to see unless you happen to live near one of the archives that has a print and they happen to program it. Still, in the hope of inspiring someone to restore it and make it available, I proceed. 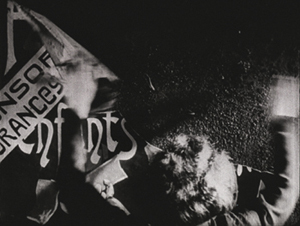 The film is Jean Epstein’s L’Affiche (“The Poster”). Epstein first made our list last year for the much better known Cœur fidèle. L’Affiche is a bit like the earlier film, a simple melodrama made in the French Impressionist style. Its situation is highly conventional, and its plot depends on a massive coincidence. The heroine is introduced as Marie, one of several women making artificial flowers. On her lunch break she thinks back to a romantic day she spent in the country. There she meets a young man, Richard. The couple go to an expensive restaurant, and Richard seduces Marie, and then abandons her, driving away alone the next morning. Three years pass, and Marie has a small child, also named Richard. She enters him in a contest for the most beautiful child, with a cash prize, offered by an insurance company that wants to put the winner on their advertising posters. The boy wins, and Marie signs a 10-year contract for the rights to use little Richard’s image. The child dies, however, and Marie visits his grave. As she leaves, she sees a huge poster with his image. The campaign has begun. Everywhere in Paris she goes, she sees the poster and finally begs the insurance company to end the campaign. The boss, however, refuses. Marie begins tearing down the posters, and she is soon arrested. 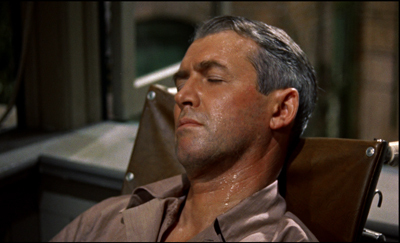 Epstein handles the arrest scene without an establishing shot but builds it up through close-ups. Initially we see only the back of Marie’s head and her arms tearing down a poster. There a cut-in to slightly closer framing as a policeman’s hand comes into the shot and touches her shoulder. A third shot shows her turning to the officer and staring in a way that suggests she is becoming mentally unbalanced. Finally a long shot establishes the scene as a second policemen enters to help arrest her. It’s the sort of gradual revelation of space that Kuleshov was working with at the same time. The boss of the insurance company is informed of this and sends his son to file a complaint against her. New copies of the poster are being put up all over town. The son is none other than the Richard who seduced Marie years before. Hearing her tale, he asks her forgiveness and takes her home to his parents. The father forbids their marriage, they marry anyway, and eventually (after his own younger child dies! ), the boss blesses the marriage and agrees to take down the posters. Summarized baldly, it sounds like an impossible plot to take seriously, but Epstein’s delicate, understated approach in presenting it and Nathalie Lissenko’s affecting performance as Marie manage to make it a great film. It’s full of Impressionist moments: Marie’s memory of her romantic day with Richard, a dance scene with rhythmic editing, a dream sequence, and plenty of gauzy shots and fancy wipes at transitions. Earlier this year I complained because L’Affiche was not included in the big new box set of Epstein’s work, despite almost everything else from the period being there. It’s also not on the box set of films made at the Russian emigré studio, Albatros, even though Epstein’s other three Albatros films are there. I don’t whether there are rights problems or there simply isn’t a good enough print. At least one streaming service claims to have L’Affiche available, but a search turns up numerous complaints about the site. I should make mention of one other Impressionist film that came out in 1924. Perhaps it should be on the list rather than L’Affiche. It’s Marcel L’Herbier’s L’Inhumaine. L’Herbier appeared on our 1921 list for El Dorado, and even then I expressed reservations. Most of his films seem cold and by-the-numbers to me, not to mention a bit pretentious. 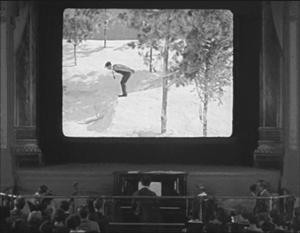 But his films were historically important, and L’Inhumaine was influential in its use of art deco sets. At one time the film was available on DVD, but it seems to be out of print. And no, it’s not Chaplin, Keaton, and Lloyd this time. Chaplin didn’t release a film in 1924. His next would be what many would consider his funniest feature, The Gold Rush. 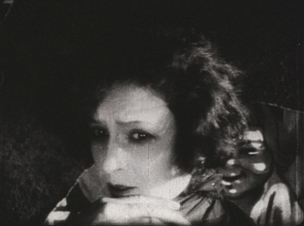 In 1924, Lloyd achieved a similar complexity with Girl Shy, one of his greatest films. He plays a bashful young tailor’s assistant who is terrified of women. Yet in secret he writes a guide for seducers, taking on the narrational persona of a jaded man of the world. Clearly he has taken his inspiration from movies of the day. 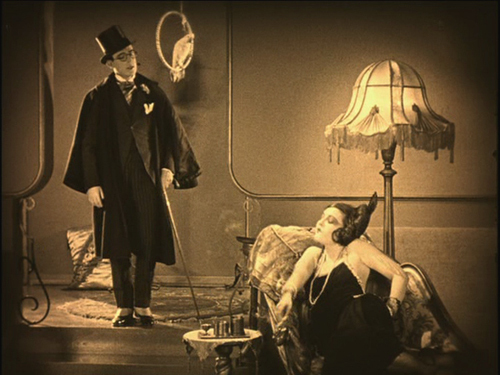 The imaginary scenes from his book dramatize his success in gaining the love of a vamp (see bottom) and a flapper. The publishers decide that the book is so over the top that they will publish it as a comic story. During all this Harold develops a relationship with Mary, a quiet young woman from a wealthy family. 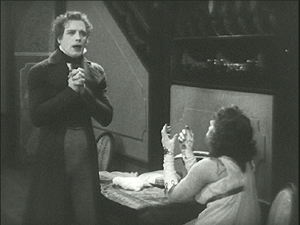 When her father tries to buy Harold off, he pretends to spurn Mary. She is about to marry a rich man, but Harold determines to stop the wedding. 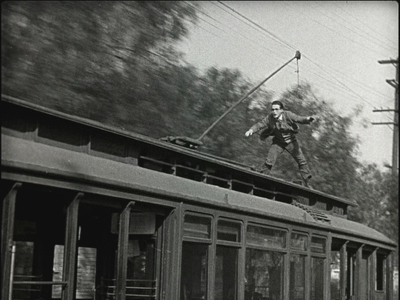 There develops one of the most epic chase scenes in all silent comedy, and indeed all cinema, as Harold commandeers all manner of vehicles, from cars and wagons to a firetruck and a speeding trolley (above). Even Keaton never outdid that one. But from 1923 to 1927, these two each created a string of innovative, carefully crafted, hilarious films. Girl Shy used to be available in a 3-DVD set from New Line, but that is no longer available–though one optimistic third-party seller offers it, still sealed in plastic, for $399.99). Now the individual releases of each DVD seem to be slipping out of print as well. Volume 1, which contains Girl Shy, is definitely out of print. Be forewarned: Volume 2, which includes the wonderful 1927 film The Kid Brother (look for it on a future list) seems like it’s not long for this world, and the same is true of Volume 3, with For Heaven’s Sake (1926). The plot of the dream emerges after this virtuoso transition, and it remains hilarious throughout. The chase, while not quite as dazzling as the one in Girl Shy, has considerable variety of vehicles (one wonders if the two comics were consciously trying to best each other), including a passage where the hero rides the handlebars of a speeding motorcycle, unaware that the driver has fallen off. Kino has packaged Sherlock Jr. together with Keaton’s early feature, The Three Ages (1923), and released them both on DVD and Blu-ray. The third funny man was Ernst Lubitsch. 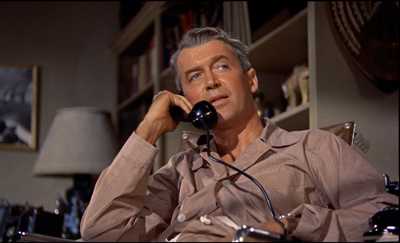 The Marriage Circle was his second Hollywood film, and one of his best. Lubitsch had started out as a comic in silent shorts in Germany, but unlike the famous Americans, he entirely gave up acting to direct. 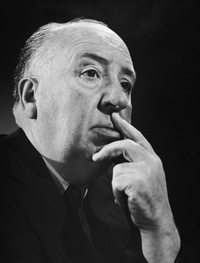 Not that he directed only comedies, but his best films, including Lady Windermere’s Fan, Trouble in Paradise, and The Shop around the Corner, fall into that category. The Marriage Circle is a light romantic comedy, following a chain of flirtations and misunderstandings. Prof. Stock has realized that his pretty young wife Mizzi has begun to neglect and nag him. She is soon attracted a newlywed, Dr. Braun. Mizzi happens to be an old friend of Braun’s wife Charlotte, which gives her opportunities to flirt aggressively with Braun. Charlotte is in turn admired by Braun’s medical partner, Dr. Mueller, though she laughs off his attempts to woo her. It has often been pointed out that Lubitsch is a director of doorways. That’s not always true, but The Marriage Circle is built around visits. The five characters visit each other in various combinations, and the string of attempted seductions and jealousies builds. Stock encourages Mizzi’s pursuit of Braun, since he wants an excuse for a divorce. Charlotte naively pushes Braun into visiting Mizzi at home when she plays sick. This is the first film where one can see the “Lubitsch touch” in action. It’s an ability to use film techniques to hint at something naughty. Here the innuendos are aimed at the characters. We know more than any of them does, and the humor arises from watching them misinterpret what they see and hear. When they finally learn of their mistakes, they end the “circle” of the title. The Marriage Circle is available to rent or buy in digital form on Amazon. I know nothing about the source or the quality. The only DVD easily available is a region 2 French one under the rather blah title Comédiennes. The print is distinctly soft (as the frame above suggests) but acceptable until a better one becomes available. Greed is often spoken of as the film that historians and buffs would most like to see rediscovered. 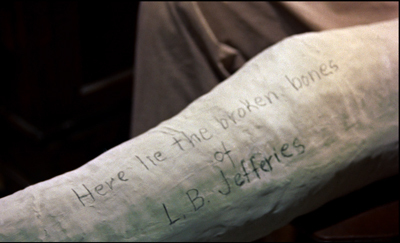 Part of it survives, of course–about two hours out of the original eight or so. Its producer, MGM, had it was edited down into a reasonably coherent feature, mainly by cutting out a number of characters and their subplots. I won’t say much about the film here, since it is already quite well-known. The film is an adaptation of Frank Norris’ novel McTeague done in a naturalistic style, which was unusual for Hollywood films of that or any other day. It follows McTeague, an unlicensed dentist, who steals his friend Marcus’ girlfriend, Trina, and marries her. Their luck fluctuates, as Trina wins a lottery and McTeague is thrown out of work for not having a license. Trina becomes an obsessive miser, and McTeague, by now an alcoholic, murders her and flees to Death Valley with her money. I find a lot of Greed heavy-handed and obvious. (I prefer the simpler Blind Husbands, which made our ten-best list for 1919.) It has an interesting style, however, with a lot of proto-Wellesian deep focus and low angles, complete with, in the case of the frame above, a hint of a ceiling. The final sequence in Death Valley is also very effective. Apart from being 75% lost, Greed has never been released on DVD. (See Indiewire for comments on this.) 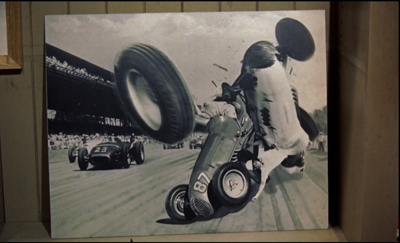 In 1999 Turner Classic Movies edited a four-hour version, inserting production stills to suggest the missing scenes. This was reasonably effective, but it seems impossible to find a print of it that is not washed out and fuzzy. 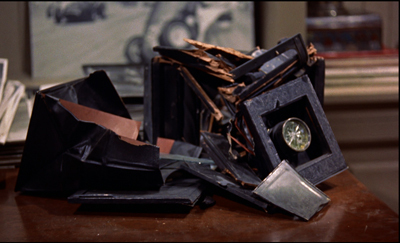 We’ve tried taping off TCM, as well as buying the VHS and laserdisc releases of that version. They all verge on unwatchable. I hope that the situation is not left where it is and that a true restoration is eventually done. My frame above comes from an archival 35mm print, so clearly better material exists. The lost film that I would most like to see discovered is Lubitsch’s Kiss Me Again (1925). Given that it was made right before Lady Windermere’s Fan, there’s a good chance that it’s a masterpiece. 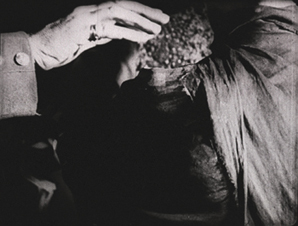 Last year I put Man Ray’s experimental short, La retour à la raison, on the list. Comparing experimental shorts to fiction features, though, seems unfair. This year I’m separating out the experimental category and will try to choose at least one film each year. 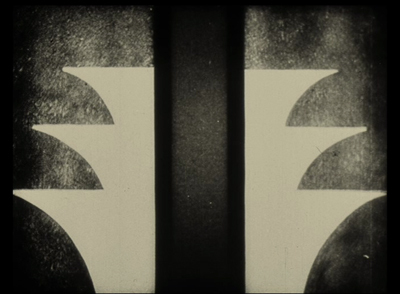 This year it’s Walter Ruttmann’s Opus 3, the third of his four films done with abstract animation. All of the Opus films plus other Ruttmann shorts are available on a DVD set with Berlin, die Sinfonie der Grossstadt and Melodie der Welt. If you want to sample just Opus 3, which is about four minutes long, it has been posted multiple times on YouTube. Although a bit dark, this is the best copy I’ve found, and it has a nice, appropriate score by Hanns Eisler. Thanks to Jonah Horwitz for a correction. Shameful or shameless self-promotion? YOU decide! All the authors of pieces in Matt Zoller Seitz’s forthcoming Grand Budapest Hotel book are given the Max Dalton treatment, in the vein of The Wes Anderson Collection. Herewith, the contributor portrait of your obedient servant. And in CinemaScope! Yes, I am happy. Yes, it’s a credible likeness. Yes, said book is due out on 10 February from Abrams. No, I will not be getting a tattoo of it. Thanks to Matt and Eric Klopfer of Abrams. 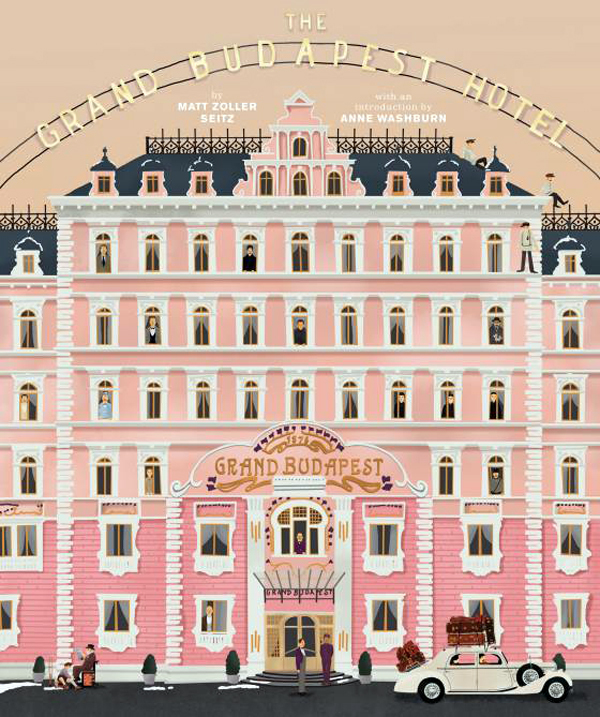 I didn’t plan it, but this has been the year of Wes Anderson on our blog. After an entry on The Grand Budapest Hotel and its play with aspect ratios, I posted an analysis of Moonrise Kingdom (my favorite Anderson movie). Now comes a book from the indefatigable Matt Zoller Seitz that continues the work of his splendiferous Wes Anderson Collection. Matt provides critical commentary, natch, along with many interviews with Anderson and his creative team. Some critics have a look-in as well. I add my $.02. You can read more on Vulture here. Available from Abrams on 10 February–too late for the December holidays, but well ahead of Valentine’s Day.